September 23-25 at massive WestWorld event center in Scottsdale, Ariz.
ENSENADA, Mexico—To further enhance SCORE International’s presence in the market and to grow exposure for SCORE teams and sponsors, SCORE International has committed to be the presenting sponsor of the upcoming 2nd annual International Off-Road & UTV Expo. The rapidly expanding public event will be held Sept. 23-25 at WestWorld, the renown multi-use facility in Scottsdale, Ariz.
With over 240 vendors, the International Off-Road & UTV Expo, presented by SCORE International, will also include product demos as well as a variety of special exhibits and ancillary events tied to the main event on the grounds of WestWorld. WestWorld, centrally located in the heart of Scottsdale, a prominent Phoenix suburb, is one of the premier, nationally-recognized multi-use facilities in the Southwest. The facility covers 386 acres with over 300,000 square feet of exhibit space in multiple buildings. The facility also offers RV Camping to exhibitors and attendees at its myriad shows and events held annually. Launching the festivities for this year’s International Off-Road & UTV Expo, presented by SCORE International, will be a special International Off-Road Film Festival at 7 p.m. on Thursday, Sept. 22 at the nearby Studio Movie Grill and the AMA EnduroCross Series stop at WestWorld at 7:30 p.m. on Friday, Sept. 23. The lineup of videos/films for the film festival includes Dezert People 13, Crusty Demons, History of Freestyle MX, and Busted Knuckle Films. Also part of the festivities is a UTV Show-N-Shine to benefit for the Children of Fallen Soldiers non-profit. The show hours will be from 1 p.m. to 9 p.m. on Friday, Sept. 23, from 9 a.m. to 6 p.m. on Saturday, Sept. 24 and from 9 a.m. to 4 p.m. on Sunday, Sept. 25. In additional to all of the industry exhibitors who will be part of the show in late September, SCORE will have an indoor-outdoor exhibit area features ‘Black Beauty’, the eye-catching SCORE 18-wheel transporter along with a collection of SCORE desert racing vehicles, a SCORE merchandise and apparel store and SCOREvision, the elaborate, double-sided LED screens projecting the latest in SCORE video content and racing programs that air on the CBS Sports Network nationally and are syndicated internationally. SCORE International, the world’s foremost desert racing organization, has been sanctioning and producing events in the Southwestern United States and Baja California, Mexico since it was founded by the late Mickey Thompson in 1973. Currently the SCORE World Desert Championship features four races, all in Baja California, and anchored by the iconic, internationally-known SCORE Baja 1000, which will be held in Ensenada, Mexico for the 49th time this Nov. 15-20. 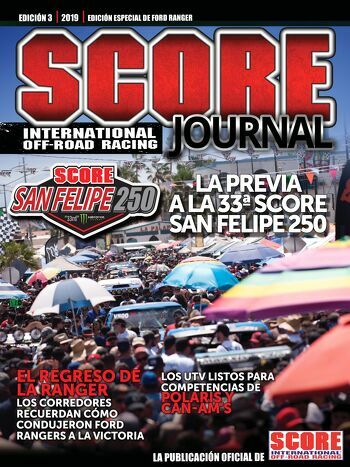 This week, SCORE is producing in Mexico the Rosarito Beach 20th SCORE Desert Challenge, a unique format race with all classes running four laps over a rugged 32.1-mile race course split into two sessions. The car, truck and UTV classes will race on Friday and Saturday while the motorcycle and quad classes will run their two sessions this Sunday. For complete information on the expo, visit http://internationaloffroadexpo.com/. All races in the four-race 2016 SCORE World Desert Championship, along with the special SEMA SCORE Baja 1000 Experience and qualifying for the SCORE Baja 1000 from Las Vegas Motor Speedway are once again airing in the USA and Canada on the CBS Sports Network. The spectacular Baja 1000 show will not only feature SCORE Trophy Truck coverage, but also top action and highlights from many other classes of trucks, cars, UTVs, motorcycles and quads – making sure that the most exciting footage and most compelling stories continue as part of each race event broadcast.